Scott A. Travers (right) with James A. Baker III, Secretary of the Treasury under President Ronald Reagan, in 1986 at the gold American Eagle First Strike Ceremony in West Point. Travers was invited by Secretary Baker to strike one of the first gold American Eagles, which was later given to him. PCGS certified it as Mint State 68. 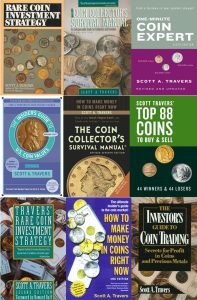 Scott A. Travers is author of the coin field’s bestselling books, including The Coin Collector’s Survival Manual, Revised Seventh Edition, the most honored hobby book of all time. His books are available online and at bookstores everywhere. Named “Outstanding Young Numismatist” (1978) by the American Numismatic Association (ANA). This award is the ANA’s highest honor given to a member under the age of eighteen. The award carried with it a collection of U.S. gold coins ranging in denomination from quarter eagle through double eagle. NLG Extraordinary Merit – Broadcast Journalism Award for the “Bloomberg Moneycast,” January 2000. Interviewed/featured many times on CNN; CNBC; FOX; Telemundo; Reuters Television; WABC and WNBC. Featured on the AOL Welcome screen (three days in a row in 2006). The 2006 publication of The Coin Collector’s Survival Manual was the subject of syndicated network television news features on ABC and FOX. Interviewed on ABC-TV’s Good Morning America, NBC-TV’s Today, CBS-TV’s Sunday Morning, and multiple times on ABC News Now. Former on-air commentator (precious metals and rare coins) for CBS Radio/Boston. Interviewed many times on Bloomberg television and radio, ABC-radio affiliates, National Public Radio, Canada’s The World Tonight, AMEX Business Talk segment of the New York Stock Exchange Radio Network, Inside Edition (twice prominently) and on various other radio stations throughout the nation. 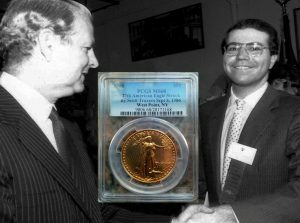 Featured in articles and quoted about coin collecting and investing in: Business Week, Barron’s, Forbes, The Wall Street Journal, Newsweek, The New York Times, New York Post, Record of Hackensack; The Los Angeles Times, The International Herald Tribune, Library Journal, Trader Monthly,Millionaire, Atlanta Constitution Journal; USA Today, Money magazine, Continental Airline In-flight Traveler; Cigar Aficionado, WatchTime and others (as well as cited regularly in the leading trade references and periodicals).